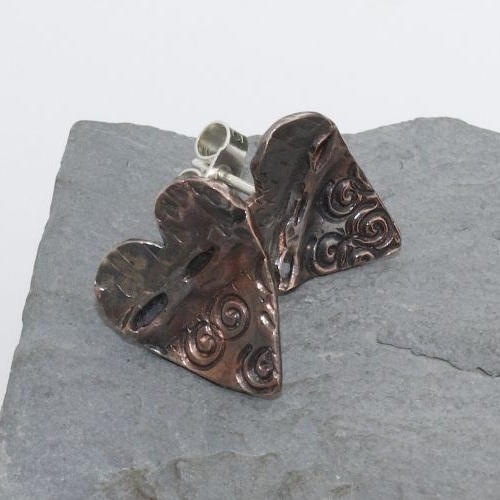 These Fold Formed Hearts are exclusive to Julie Brandon Jewellery and have been handcrafted from Copper and sterling silver. I first fold formed and textured a strip of copper. 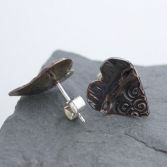 I then use a piecing saw to cut out the heart shapes, the hearts are domed and polished. I then solder on sterling silver ear post. Finally i add a patina (which darkens the copper) to show off the lovely textures i re-polish the high spots to add contrast. 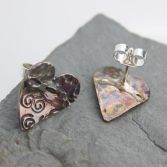 These beautiful Heart studs are made to order so please allow 4-5 days from date of ordering. Please note that due to the handcrafted nature of these earrings no two pairs will be identical, however the images shown are a good representation of the earring you will receive. Copper has a beautiful warm quality and is renowned for it's healing ability and is often worn to alleviate symptoms of arthritis. 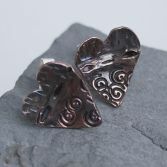 Your Fold Formed Hearts will be presented in one of out signature gift boxes and posted via Royal Mail special delivery (signed for) to any address within the UK free of charge.